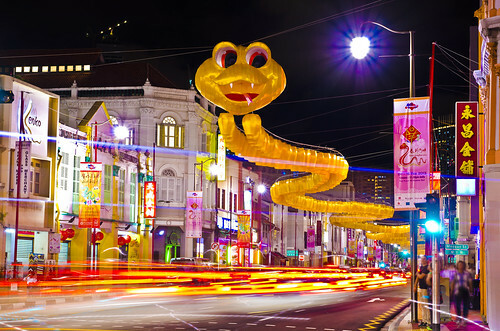 Singapore - Chinatown Chinese New Year Decoration, a photo by Wang Guowen (gw.wang) on Flickr. Looking forward to this festival where family,friends will get together with ang baos being exchange.Lotsa of goodies will be available too.
.:Taken from From Wikipedia, the free encyclopedia:. As the largest ethnic group in Singapore is Chinese, Chinatown is considerably less of an enclave than it once was. (Note: The name Chinatown （唐人街） is usually used by non-Chinese Singaporeans whereas Chinese Singaporeans usually use the term Niu Che Shui （牛车水） as the term Chinatown （唐人街） usually refers to enclaves of Chinese people in regions where Chinese people are the minority ethnic group.) However, the district does retain significant historical and cultural significance. Large sections of it have been declared national heritage sites officially designated for conservation by the Urban Redevelopment Authority. Chinese New Year is the most important of the traditional Chinese holidays. In China, it is known as "Spring Festival," the literal translation of the Chinese name 春節 (Pinyin: Chūn Jié), since the spring season in Chinese calendar starts with lichun, the first solar term in a Chinese calendar year. It marks the end of the winter season, analogous to the Western carnival. The festival begins on the first day of the first month (Chinese: 正月; pinyin: Zhēng Yuè) in the traditional Chinese calendar and ends with Lantern Festival which is on the 15th day. Chinese New Year's Eve, a day where Chinese families gather for their annual reunion dinner, is known as Chú Xī (除夕) or "Eve of the Passing Year." Because the Chinese calendar is lunisolar, the Chinese New Year is often referred to as the "Lunar New Year". you can visit my website at www.on9cloud.com . Do not use my photos in anyway without my explicit permission. ...... . .. .. .